Let’s face it, getting bitten by mosquitoes and putting up with the itchy welts is a pain. There’s plenty of commercial insect repellents and sprays that can help make you unappealing to pesky mosquitoes, but if you’re caught unprepared and don’t have any on hand, here’s an equally effective method using Vicks VapoRub. How to use it: Just rub a little on your skin and clothes. You don’t have to rub it all over so just focus on dabbing it on your ankles, wrists, neck, and inner elbows. 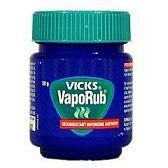 Why it works: Vicks VapoRub contains cedarleaf oil, which is a natural insect repellant. If it’s too late to prevent mosquito bites, rubbing VapoRub on the bumps will also relieve your itching. Why? The itching is caused by an anti-bloodclotting agent from the mosquito’s stinger (this keeps your blood flowing instead of clumping up so the mosquito can drink). The menthol and camphor in the VapoRub will boost blood circulation and help break up this bloodclotting agent, thereby relieving you of the annoying itch. Note: If you don’t have VapoRub on hand, other menthol/camphor rubs and ointments like Tiger Balm, Watkins Menthol Camphor Ointment etc will work just as well. Just check the ingredient labels for menthol and/or camphor. This is such an awesome tip!!! I’ve used it last summer, and I didn’t feel my mosquito bites one bit. What I like to do is put a small bandaid over the place I rubbed the VapoRub on so it doesn’t get all over the place. Thanks for saving me from itching myself till I bleed!!! My husband and 2 sons are going camping (scout camp) in mosquito heaven next week and I am heading to stock up on Vick’s VapoRub. What a great tip, I am so excited that those harsh sprays will not have to be used. My husband is also excited that he will not have to hang the little Lavender clumps all around the tent, way too girlie even if it does work. Hi Narcy, most people say that Vicks Vaporub is okay for use when pregnant, including many women who’ve used it during their pregnancy. So you might want to ask your doctor first. I’ve never heard anything about adverse affects on pregnant women, but personally I use a a mosquito trap that uses counterflow technology to protect my property. Works like a charm and I’d definitely recommend looking into it if you ever get tired of trying home remedies like did! An excellent idea – two birds with one stone! Repel the mosquito’s while keeping your airways wide open to enjoy the fresh air. Definitely something I will be considering on my next holiday. I’ve actually used vicks for this purpose while in Thailand, the flys there are insane, they look like little airplanes. Wouldn’t use it at a barbaque, it does smell pretty bad. I have also heard that if you have a problem with bed bugs bites to put some on them. I recently visited a friend in New York, not knowing that they are real bad up there, and got bit all over my legs. I was skeptical at first and thought it is worth a shot. I applied some to the raised welts right before they started to itch and it was like magic. While my friend continued to itch. It wont make them leave but at least you won’t be up all night itching or having to take allergy medication that makes you sleepy. I much rather smell like menthol than be sleepy all day. I hope that this helps anyone that has this problem! Awesome! I can put some IceyHot on & not get sore gardening or bitten by bugs!?!? I’m in! I can’t go from house to car w\out being attacked. Yes, it should work if there’s enough menthol in it. Didn’t work for me, I am covered in bites right now and have contracted cellulitis as a result twice this summer. The Vicks is doing nothing for the pain and a mosquito actually landed on where I put the Vicks as a repellent! Can I used this on my dog? She’s been biten all over. I don’t think it’s safe for animals as they might lick it off and ingest it.